This post is written for the Quote Challenge, nominated by fellow blogger “Faraday’s Candle“. Thank you so much for the nomination. The two sisters maintain an awesome blog with science posts. You should sure check out the blog. You will sure enjoy every post there! is all about understanding the little thing that lies between ‘yes’ and ‘no’. Well yes or may be no! or that i don’t know! Sun, Moon. Sun. Moon. Sun – Moon. What i mean in those six words is, With sun representing light and moon for dark, we all have them in various combinations returning everyday. They come one or the other, one after another or together. 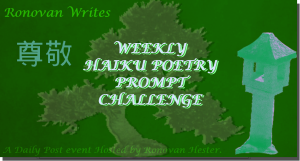 This Haiku is written for Ronovan Writes Weekly Haiku Poetry Challenge Number 81. The prompt is to write a haiku on the words Trill and Final. Note: Meaning of Trill – a quavering or vibratory sound, especially a rapid alternation of sung or played notes. This story is written for Sunday Photo Fiction: 24 January 2016. The task is to write a short story of 200 words or less for the supplied photograph. There is tallest. There is shortest. There is largest. There is smallest. Every kind makes its name. What matters is, you stand still. You will get hammered, beaten, thrashed, pounded, drenched, every unnamed kind and order. It’s about how you take them all. It’s not easy to stand still and unshaken. It needs a lot of determination. It comes with a price and pay. Today to stand still, there were many yesterday’s of slog. The tallest building in London – the Shard, has a message. It’s very momentous and a lesson for life. Said the dad to his son. Son promptly replied, “Yes dad, I know you were one of the engineer’s behind it and I am very proud of you”. At times, Silence does it all!